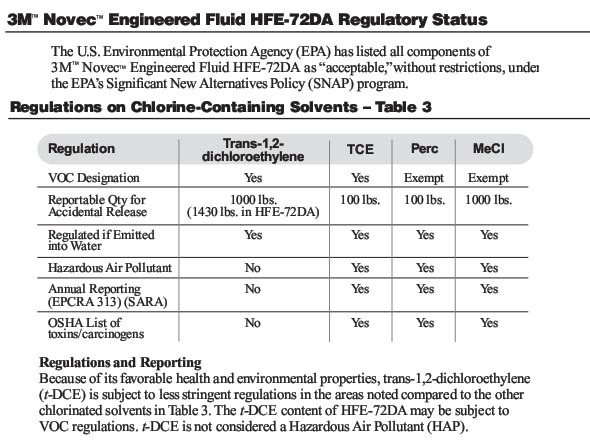 3M Novec Engineered Fluid HFE-72DA is a blend of hydro?uoroether methyl nona?uorobutyl ether (C4F9OCH3), ethyl nona?uorobutyl ether (C4F9OC2H5), trans- 1,2-dichloroethylene (t-DCE) and isopropanol. This mixture of solvents is a blend of azeotropes. The blend has been analyzed during evaporation and extended use in a vapor degreaser and found to have a consistent composition that is effective for medium- to heavy-duty degreasing and de?uxing applications. Novec ?uid HFE-72DA is ideal for a wide range of electronics and other precision cleaning applications. It is intended to replace CFCs, HCFCs, HFCs, nPB and chlorinated solvents. This Novec product has zero ozone depletion potential and other favorable environmental, health and safety properties (see Table 2). The high solvency, low surface tension, non?ammability and stability of HFE-72DA ?uid make it ideal for immersion and vapor degreasing applications. The isopropanol in HFE-72DA ?uid provides enhanced removal of ionic contaminants. 环境及安全性质Environmental and Safety Properties- Table 2?????? ?